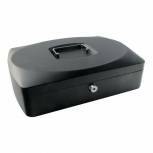 Q-Connect 8 inch Black Cash Box KF02602 Pack of 1 Eight inch cash box with removable tray compartment. Supplied with two keys. Ideal for storing valuables and cash. Dimensions - 155x198x85. Colour - Black. Q-Connect Blue 6 Inch Cash Box KF02608 Pack of 1 Six inch cash box with removable tray compartment. Supplied with two keys. Ideal for storing valuables and cash. Blue. 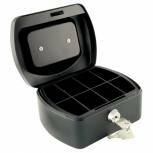 Q-Connect 10 inch Black Cash Box KF02603 Pack of 1 Ten inch Cash Box with removable tray compartment. Supplied with two keys. Ideal for storing valuables and cash. Dimensions - 180x245x90. Colour - Black. 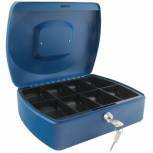 Q-Connect Blue 8 Inch Cash Box KF02623 Pack of 1 Eight inch cash box with removable tray compartment. Supplied with two keys. Ideal for storing valuables and cash. Blue. 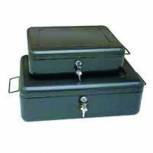 Q-Connect 12 inch Black Cash Box KF02604 Pack of 1 Twelve inch cash box with removable tray compartment. Supplied with two keys. Ideal for storing valuables and cash. Dimensions - 240x295x90mm. Colour - Black. 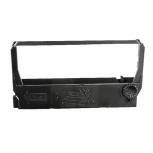 Safescan SD-4141 Standard Duty Cash Drawer Black 132-0425 Pack of 1 Safescan SD-4141 Standard Duty Cash Drawer Black 132-0425. Cash drawer with 8 coin and 4 note compartments. Tough steel casing with shatterproof PVC inner tray. Ball bearing rollers. 3 position lock with 2 keys. W410 x D415 x H115mm. 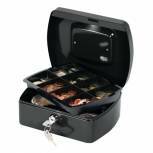 Q-Connect 6 inch Black Cash Box KF02601 Pack of 1 Six inch cash box with removable tray compartment. Supplied with two keys. Ideal for storing valuables and cash. Dimensions - 120x150x80. Colour - Black. 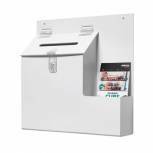 Deflecto Lockable Ballot/Suggestion Box White DEOPBKTYT Pack of 1 Free standing or wall mountable white plastic suggestion box with 110mm wide literature pocket. Includes wall mounting fixings, lock and two keys. Ideal for voting slips, suggestions, raffle tickets, comment cards and more. W349 x D92 x H330mm. 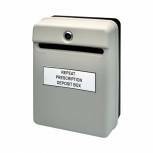 Helix Posting Suggestion Box Grey W81065 Pack of 1 Helix Post Suggestion Box. 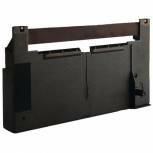 High quality plastic front with steel back which can be fixed to either the wall or door. 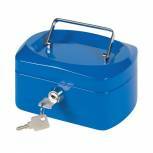 Water resistant, includes lock and 2 keys and is supplied with 4 fixing screws. Dimensions - W235xD130xH310mm. Colour - Grey. 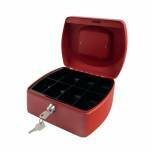 Q-Connect Red 8 Inch Cash Box KF04249 Pack of 1 Cash box ideal for storing valuables and cash. Includes a removable tray compartment. Supplied with 2 keys. 8 inch. Red. 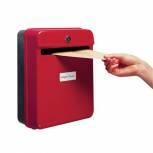 Helix Post/Suggestion Box Red W81060 Pack of 1 Helix Post Suggestion Box. High quality plastic front with steel back which can be fixed to either the wall or door. Water resistant, includes lock and 2 keys and is supplied with 4 fixing screws. Dimensions - W235xD130xH310mm. Colour - Red. 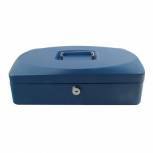 Q-Connect 10 inch Blue Cash Box KF02624 Pack of 1 Ten inch cash box with removable tray compartment. Supplied with two keys. Ideal for storing valuables and cash. Blue. 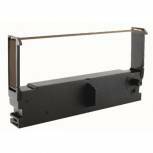 Cash Register Purple Ribbon ERC18 PC2075 Pack of 1 PC2096 Ribbon purple ERC18 Casio 4100SR/4110/4600ER/ CE4500/TK1200/TK2100/ TK2200/TK2600/CE4530/ CE4105/CE4630/SA1000/ SA2000/PCR208/Epson 2630/ 2636/2640/2661/ERC18/ M2626/M2640/M2661/M2600/ General G3200/G3210/G7500/ Omron RS5510/RS5541/RS5585 RS8500. 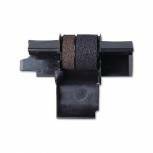 Cash Register Black Ribbon ERC09 PC2098 Pack of 1 PC2098 Ribbon black ERC09 for use in Epson ERC009/ERC80/HX20/ HX40/160/185/M1500/M158, General G1800/Omron CAT110 POS50. 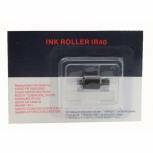 Cash Register Purple Ribbon ERC23 PC630 Pack of 1 PC630 Ribbon purple ERC23 for use in Canon TX50111/Epsom ERC23/ ERC30/M250/M252/M255/ TM267A/TM267C/TM300D/250/ 252/255/257/IBM 4651/4655/ 4661/Sharp ER2975/ER3210. 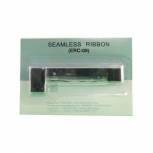 Cash Register Ribbon Purple ERC32 PC687 Pack of 1 PC687 Ribbon purple ERC32 for use in Casio 4700/TK2300/TK2700/ Epson ERC32/M820/M825/ Sharp A550. 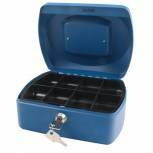 Q-Connect 12 inch Blue Cash Box KF02625 Pack of 1 Twelve inch cash box with removable tray compartment. Supplied with two keys. Ideal for storing valuables and cash. Blue. 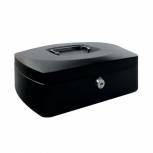 Helix 16 inch Document Box Black W78040 Pack of 1 Lockable document box provides secure storage for professional and domestic documents. With rounded edge design and handles for ease of use. Supplied with two keys. W405x D270 x H121mm.